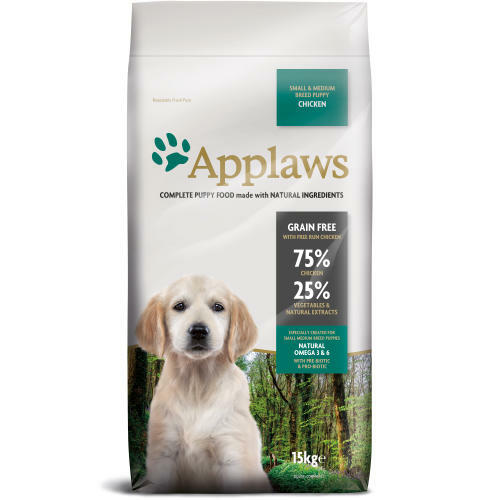 Applaws Chicken Large Breed dry puppy foodcontains 75% meat, and does not contain cheaper additives like cereal orgrains to bulk up the food. High protein, meat based diets are thenatural and healthy way to feed your dog as they are easier to digestthan other diets with large proportions of grains and cereals which canlead them to have a high carbohydrate intake and potential weightissues. Applaws can help your dog maintain a healthy and active lifestyle. Lowcarbohydrate means less build up of body fat. High natural meat proteinmeans lean muscle tissue encouraging your dog to reach its true geneticpotential. Protein 39%, Crude Oils and Fats 22%, Crude Fibres 4%, Crude Ash 8.5% Calcium 1.6%, Phosphorous 1.31%, Carbohydrates <21.5%.